Heading to university for the first time was an adventure for many reasons. Not only did I join the throngs of college newbies who had never lived away from home, but I made what seemed a very long journey from Vancouver, Canada to Greeley, Colorado to be a part of the University of Northern Colorado’s music program. With my flute clutched in one hand, my alto sax slung over my shoulder and many of my worldly possessions packed into boxes, I moved into a dorm room that could only be described as undersized and worn-out. To me, however, it was independence at its finest. A few pink throw pillows later, it looked as homey as any eighteen-year-old girl could hope for. Then there was the cafeteria. With legends of the “freshman fifteen” echoing through my head, I walked into the place where I was scheduled to eat all of my meals for the next 10 months. I will spare you the details of the cafeteria’s offerings and just say that I was elated when, halfway through the year, they added a make-your-own-sandwich bar, complete with whole wheat bread, sliced turkey and veggies. I have never been so happy to see a fresh tomato in my life. In those days, I wasn’t much of a cook and equipping myself with a slow cooker didn’t even occur to me. The closest I came to “cooking” that year was pouring boiling water from my electric kettle into a Cup-O-Noodles. Awesome. These days, however, it seems as though college students are a little more culinarily savvy. With a stash of basic kitchen utensils, a fridge to store ingredients and a crockpot, they are able to pull together healthy meals that are ready by the time they arrive home from a long day of classes. Now that I am a mum of two boys, I also see the benefit in pulling out the crockpot. Throw the ingredients in and, eight hours later, you have a meal for your family. On meatless nights, we may turn to this Crockpot Chickpea Stew with Balsamic Caramelized Onions. 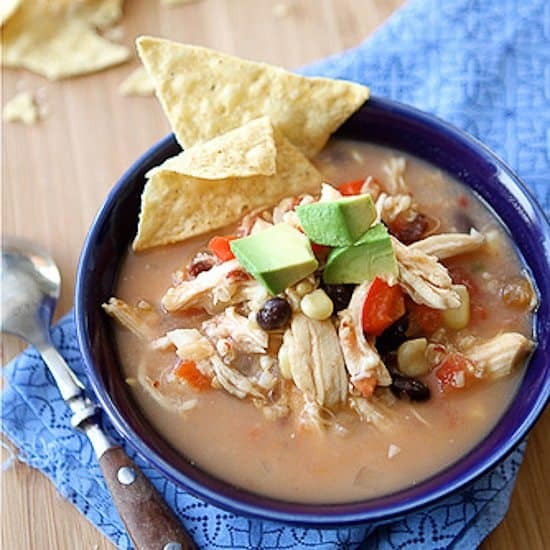 Other times we rely on soups, such as this chicken tortilla soup, packed with black beans, corn and brown rice. The brown rice will fall apart somewhat during cooking, which acts as a thickener for the broth. If you prefer larger grains of rice, cook the rice separately and stir it into the soup immediately before serving. The recipe was included in The Slow Cooker Challenge, hosted by The Naptime Chef & Big Girls Small Kitchen. Head to their sites for some great slow cooker recipe ideas, plus to enter your name for a chance to win a new slow cooker. 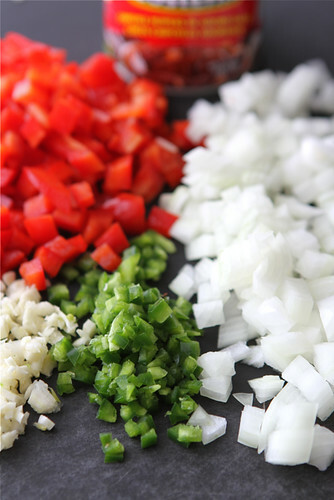 Place chopped onion, garlic, red bell pepper, jalapeno pepper, ground cumin and chipotle pepper into the bottom of a crockpot. 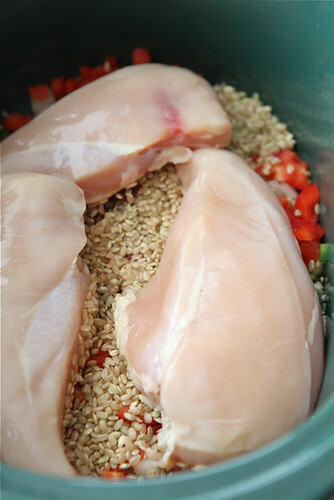 Cover this mixture with brown rice and boneless, skinless chicken breasts. Pour diced tomatoes, with juices, and chicken broth over the chicken breasts. Turn the crockpot to Low and cook until the chicken is cooked through, about 8 hours. Remove the chicken breasts from the crockpot and, using two forks, shred the chicken. Return the chicken to the crockpot, along with the black beans and frozen corn. Cook on Low for an additional 30 to 60 minutes. Stir in chopped cilantro and fresh lime juice. Season with salt and pepper, to taste. Serve with chopped avocado, tortilla chips and sour cream, if desired. Pour diced tomatoes, with juices, and chicken broth over the chicken breasts. Turn the crockpot to Low and cook until the chicken is cooked through, about 8 hours. 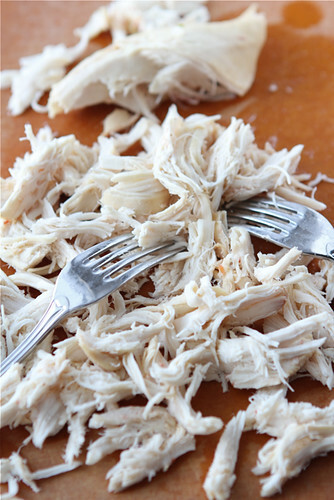 Remove the chicken breasts from the crockpot and, using two forks, shred the chicken. Return the chicken to the crockpot, along with the black beans and frozen corn. Cook on Low for an additional 30 to 60 minutes. Stir in chopped cilantro and fresh lime juice. Season with salt and pepper. Ah, the freshmen 15……it happens to the best of us! This time of year the slow cooker is a girls best friend. 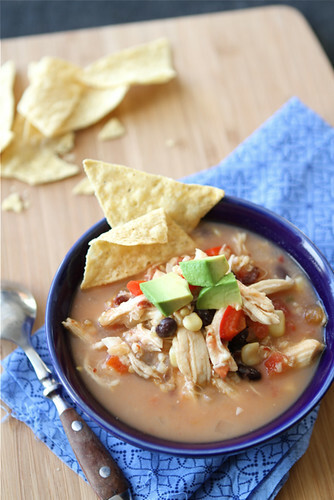 Your version of tortilla soup looks healthful and flavorful! What a colorful and delicious crock pot soup! Tortilla soup in the slow cooker is one of my most favorite dinners. Yummy and easy! I am a tortilla soup junkie, it is my go-to meal whenever I have leftover shredded meat and/or I need dinner in a pinch. I love it! I’ve never done it in a crockpot, though. That would make it even simpler. This is a great soup for the slow cooker Dara!! I am always stumped on slow cooker recipes. I love how you cooked the chicken whole, then shredded it up. And I have to say…I totally remember the one semester of cafeteria eating I had to endure…at first I was very excited about the ‘all you can eat’ ice cream and french fries…but man, I got over that real quick! I remember them offering the same type of sandwich bar and being happy as well! It sounds very tasty. I love the idea of the brown rice acting as a thickener! This is right up my alley. 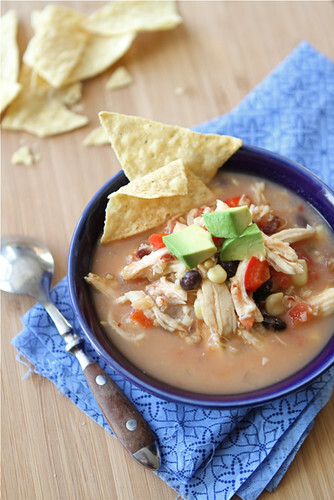 I love tortilla soup and I love this even more because of the slow cooker. Looks amazing! I love this slow cooker soup. How easy and it looks fantastic! Ah, those cup o noodles. =) I’ll take slow cooker any day! I just want to dive right in and take a swim! Yum! Lovely recipe. What size slow cooker did you use? I definitely could use a good slow cooker recipe right now, and this looks fabulous! i hope you don’t mind but i have a general slow cooker/crockpot question …. in general can these recipes be adapted for not using a crockpot? and if so how would one do it? i would think they could be cooked in a stock but would extra water/liquid be needed? how would it effect the cooking time? i’m asking because i don’t have one and can’t afford to purchase one at this point in time but would like to try some of the recipes. thanks for any suggestions/thoughts. Wish I could have this for lunch right now! Would love a bowl of this for dinner! That looks just terrific. I love soup in the crockpot. This is one I know everyone in my family would love. Oh my god, this sounds sooo easy! I love chicken tortilla soup! This is definitely gonna be made in my house next week. Thank you! Love the soup but you made me think of something that will make you smile. Bot of my brothers went to school in Golden. They always joked about traveling to UNC to meet girls that were smart AND good lookin’!!! BOYS! With three kids at home and a husband who is often deployed, I’m not sure how I’d survive without a crock pot! Such beautiful flavors in this! That is some tasty looking soup and super easy to make in the slow cooker! 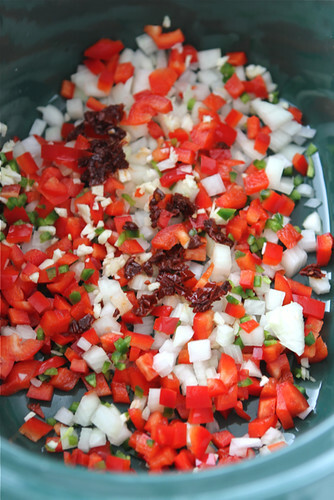 Don’t you think a little cummin,or Mexican chilli powder is needed? Hi Honey, thanks for your comment. There should indeed be ground cumin on the ingredients. I apologize for the omission. The correction was made. I hope you enjoy the soup! I’m so glad to hear that, Gail! There’s nothing better than a good soup on cold days. I could happily eat soup for day, too. Could you sub quinoa for the brown rice?